It is almost time for the most exciting part of your senior year! Graduation is just around the corner, and we would like to give you as much information as we can as we begin the planning process. The last day of school is Thursday, May 23rd. Graduation is the following week! 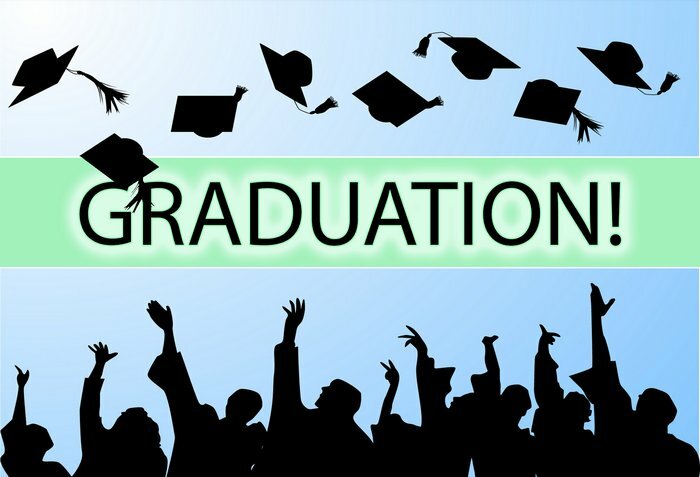 Graduation will be held Friday, May 31st, 2019, at 8pm on the PVHS Football Field. Please plan accordingly. Please read the following graduation requirements/expectations and return the attached acknowledgement/questionnaire by 3/29/2019. Please keep this letter to refer to for the upcoming events. GRADES/CREDITS/FINALS Make sure that you are passing all of your classes, so that you will be able to graduate! If you are taking credit recovery classes they must be completed by Friday, May 17th 2019. Finals will begin Friday May 17th, 2019. CAP & GOWN: A cap and gown is a requirement to walk in the graduation ceremony. If you have not yet ordered a cap and gown you may still do so at Jostens.com or by calling Jostens at 702-384-3300. You may also pick up an order form in the main office. Please be aware, the boys wear gold and the girls wear maroon. Jostens will be on campus Wednesday, March 27th, during lunch to hand out Cap & Gown and other items that you have previously ordered. SEATING: The bleacher area is open to the public. Tickets will be issued for the field seating. Based on the current number of graduates and seats available, each student will receive 4 tickets. We also need to know if anyone in the field seating area will be using a wheelchair (please see questionnaire). Children 5 and under may sit on someone’s lap and would not need a ticket. In the event of inclement weather, the ceremony will be moved to the PVHS Gymnasium and only two tickets per graduate will be allowed entrance. There will be a red Trojan head stamped on the back of two of your tickets when you receive them during Graduation Practice on May 30th, 2019 if we need to move into the gymnasium. DURING THE CEREMONY: Please arrive early to allow adequate time for seating. Field Seating gates will close promptly at 7:45pm. No food or drink will be allowed through the gates. Water is sold on the premises as a school fundraiser. Please remember no tobacco products are allowed on school property this includes cigarettes, chewing tobacco, and electronic cigarettes (vapors,etc). Also, no drugs or alcohol are allowed on school property. No balloons, signs, flowers, leis, etc. will be allowed. Please leave them in your vehicle to be presented after the ceremony. Please inform all family and friends that are attending of this policy. Professional pictures will be taken of each graduate as they exit the stage. Information on where to purchase those pictures will be included with the diplomas. Please be considerate of all in attendance, remain seated and respectful throughout the entire ceremony. DIPLOMAS: Diplomas will not be given out at the Graduation Ceremony. Graduates will need to pick them up at PVHS starting June 7th, 2019 between the hours of 7:00 am and 2:00 pm. Diplomas will be released to graduates only (not parents/siblings/friends). You must make prior arrangements with Mrs. Shockley if you plan to have someone else pick up your diploma. Bring your picture identification to pick them up. May 17th, 2019...............Finals begin– schedule to follow - you must be present for finals! Senior Checkout to follow practice – Field seating tickets will be handed out upon receipt of completed checkout sheet. (Check out sheets will be handed out in May) Senior Brunch will also be during this time.